Meet the surrealistic psychiatrist with the camp couch. She's totally twisted and continuing the mind bending experiments of her grandfather, the original Dr. Caligari. She treats her patients like human lab rats as she swaps their psychoses with cross cranial conulations. Witness the sexual fantasies of a lovely, lust-crazed Dr. Caligari -- an eroto-maniac! You'll be shocked by her high voltage therapy for a 'juiced-up' cannibal. Sigmund Freud is turning somersaults in his mausoleum over this doctor's demented diagnosis. 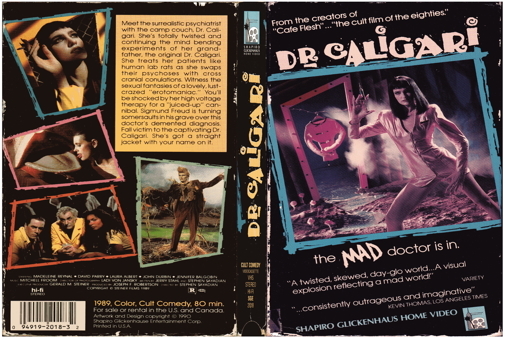 Fall victim to the captivating Dr. Caligari. She's got a straight jacket with your name on it.